On Going Classes for you or your business. 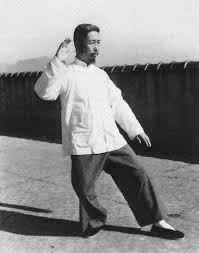 Yang Chen Fu- Considered one of the greatest Tai Chi Masters of the 19th & 20th centuries. Holder of the Yang Style family lineage. 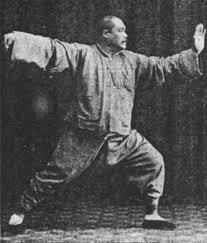 I've been practicing Tai Chi and Qi Gong since 1991 and teaching since 1997. In Tai Chi circles, the first questions one tends to get asked are: What style do you practice and who did you study with? Lineage, though not always an accurate indicator of skill level, is considered very important. Without knowing anything about teachers or styles, while living in Boulder, Colorado, I was lucky enough to respond to an advertisement in the local paper (a clipping I still have) to practice Yang Style Tai Chi Chuan. I'd like to give credit to my lineage you see at the right, the essence and spirit of these masters was transmitted to me in my studies and I humbly try to pass on my teachings to others. I need to acknowledge other teachers I've had, all masters in their own right, who helped complete my education in the Tai Chi and Qi Gong energy arts. Without them, I would not be an acupuncturist and where I am today. Sifu Warren Pretlow, for introducing me to the Yang Style Long Form, Qi Gong and the martial spirit of Tai Chi, and asking me to assist his teaching and giving me permission to teach on my own. Sifu Bill Helm, A Taoist Priest that I studied Chinese Philosophy, Tui Na Massage, Push Hands and Tai Chi Sword at the Taoist Sanctuary in San Diego. Dr. Yibin Wang, A doctor of Traditional Chinese Medicine for working with Medical Qi Gong with me in clinic at the Pacific College of Oriental Medicine. Herman Kaus, The "old man" with a walking staff (also a student of Cheng Man Ching) for imparting his fighting spirit. Even in his 80's, he was considered to be one of the greatest Push Hands Martial Artists living in America. I teach locally and nationally and have twice been featured at the National Qi Gong Association's National Conferences. I am available for workshops for health centers, insurance companies and businesses.